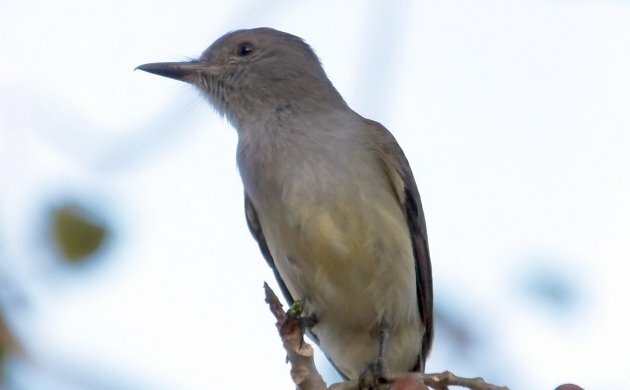 One of the quandaries of birding in Costa Rica is deciding where to go birding. Where do you go when there are so many different places to choose from? 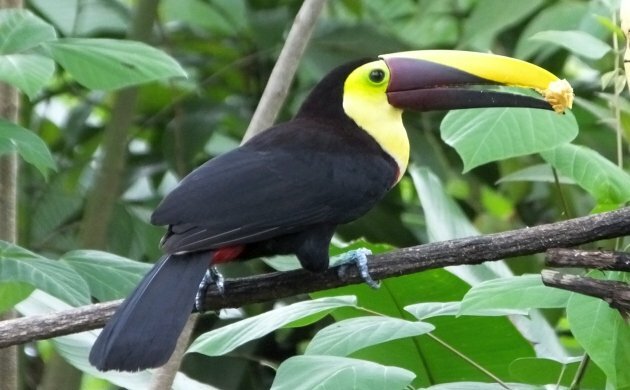 Costa Rica’s small size, ease of access and massive avian diversity promises a wealth of birds in many places. Do we watch mixed flocks in fresh cloud forest? 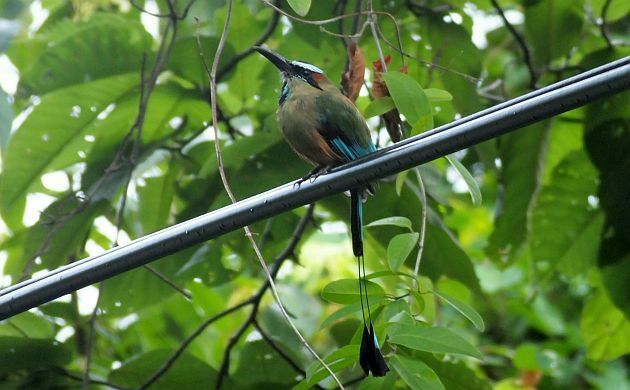 Count Turquoise-browed Motmots on roadside wires in the Pacific lowlands (like I did just last week)? The predicament is like walking into DiCamillo’s bakery and having to choose between fresh, chocolate-covered cannoli, a fantastic cupcake, or some sweet coffee cake goodness. However, in DiCamillo’s, it’s easier because you can just buy it all (except chocolate covered cannoli because according to my other half, I have reached my yearly limit). As for birding in Costa Rica, until a teleporter is invented, we have to decide whether to bird in the lowlands or the highlands, or on the wet Caribbean slope or the Pacific. 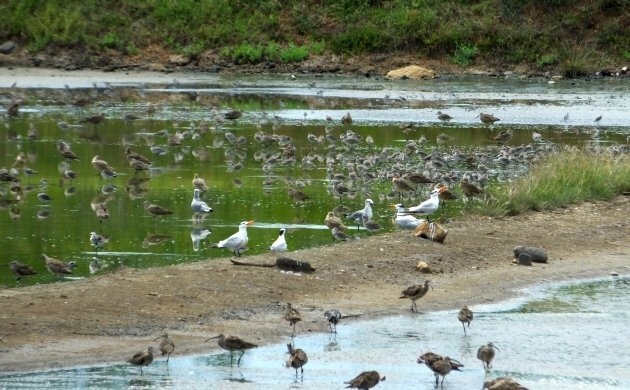 With shorebirds on my mind, the other day, we opted for birding at Punta Morales. Since this coastal site on the Gulf of Nicoya is a two hour drive, this meant leaving the house at the unwelcome hour of four in the morning. However, the promise of shorebirds, possibility of rare migrants, and chances at cool mangrove birds, we figured that the pre-dawn departure was worth it. Equipped with optics, snacks, and sunscreen, we left the house by 4:25, and thanks to low Sunday morning traffic, the drive down to the Pacific lowlands ended up being quick and easy. 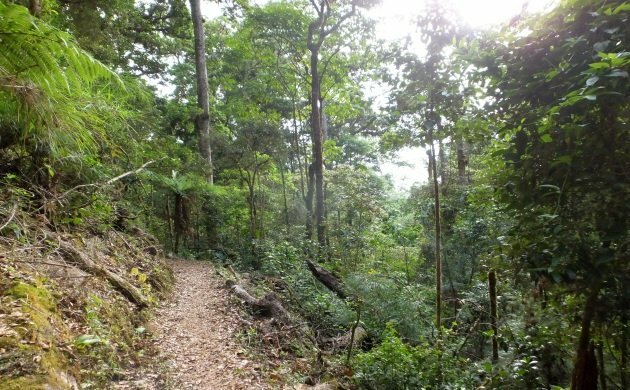 Dawn broke somewhere on the way down and was accompanied by two species of caracaras patrolling the roads, a motmot or two on the wires, and early morning on the edge of the ocean. In shape and behavior, the caracaras reminded me of Ravens that fly along the highways far to the north, likewise looking for the remains of unfortunate animals. Nothing even close to the motmot up north though. We reached the salt pans at Morales around six and were greeted by several White-fronted Parrots feeding on fruiting trees. 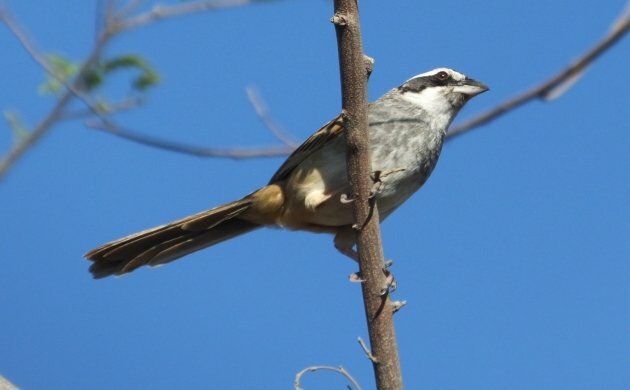 Other dry forest species made appearances, Stripe-headed Sparrows being especially common. Pishing brought out a couple of White-lored Gnatcatchers. Like all gnatcatchers, they were feisty and reminiscent of some of the Old World warblers. Panama Flycatchers and Streak-backed Orioles also fed at close range. The no-see-ums were biting but the fun birding compensated for the itching. Out on the salt pans, a few hundred shorebirds and terns rested, fed, and awaited scoping. Most were biding their time until the tide receded in the Gulf, some were already taking wing and flying to more productive feeding grounds shortly after scoping them. Fortunately, we got onto to some year birds before they left. Several Gull-billed Terns were cool, we also had Sandwich (Cabot’s) Tern among many Laughing Gulls and Royals Terns. Shorebird diversity was lower than expected but you can’t complain when Marbled Godwits are in the house. They shared the shallows with many a Whimbrel, Willets, Black-bellied Plovers, a scattering of Short-billed Dowitchers, Western and Least Sandpipers, and a few small plovers. After the salt pans, we drove over to a university-run marine field station. The guard let us in and we went to a dock to scan the gulf. Off in the distance, dozens of egrets stalked the receding tide a a few birds of the mangroves called nearby. Although the hoped for Mangrove Vireo failed to show, we had excellent close studies of Panama Flycatcher and Northern Scrub-Flycatcher. 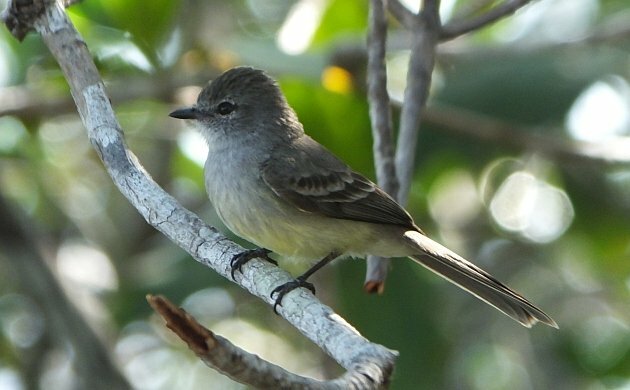 The Northern Scrub-Flycatcher looks like a cross between a Myiarchus and a tyrannulet. After we had our fill of Morales birds, we started our drive back, making one stop at Puntarenas to check for seabirds. Nothing of great interest was found but I’m still glad we checked because I have seen storm-petrels and other interesting marine species from that same spot on other occasions. After that, it was time to head back up to the intermontane valley where we and so many other people reside. 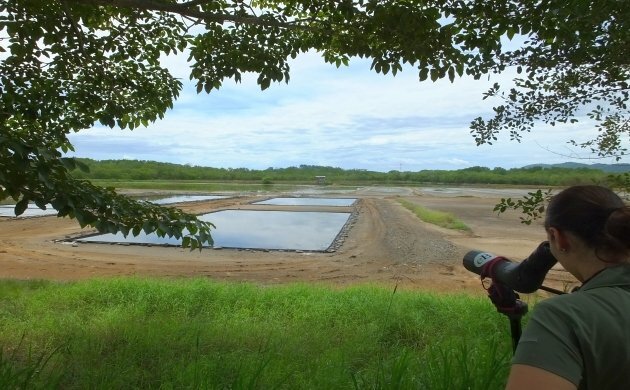 Birding was done for that day, I wonder what we will see on our next visit to Punta Morales? 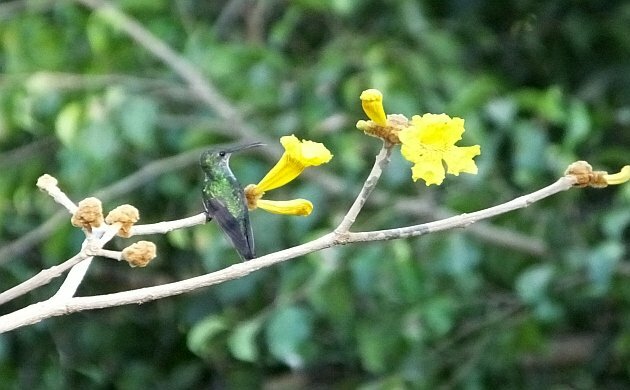 We did see the endemic and endangered Mangrove Hummingbird– a choice species for our year lists!